80-YEAR-old Catherine O’Connor from Newbridge has been named Kildare carer of the year for her extraordinary hard work and dedication. Catherine is the full time carer of her son Mark who is 55 years old. Mark contracted meningitis twice when he was a baby which resulted in a diagnosis of encephalitis. He is nonverbal, wheelchair bound, doubly incontinent, epileptic and has a severe learning disability. Catherine was nominated by her daughter Debra as a token of the appreciation for her lifetime of work and unconditional love to Mark and all of their family. 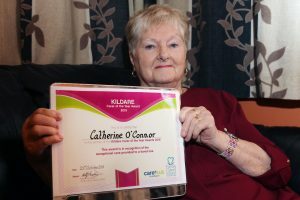 Catherine was named the 2018 Kildare CarePlus Carer of the Year and will now go forward to the national event. She also raised two other children and cared for her terminally ill husband who passed away five years ago. “She’s a very kind, caring and considerate, that’s for sure,” said Debra. “She also has four grandchildren, one grandson and three granddaughters and always has a lot of time for them as well. Catherine turned 80 in May and Debra decided to nominate her for the award after seeing it advertised on Facebook. Debra told no one that she had nominated Catherine, not even her younger brother Declan and when they received word that she had won it was an absolute shock. ““She would think someone else deserves this, she plays down what she does but she is delighted. She has never been recognised before, well other than by us, so it is a lovely achievement for her. Catherine looked after her late husband who passed away from cancer five years ago and managed to stay at home at Station Road almost right until the very end. Catherine attended the awards ceremony in Ryston where she was presented with her certificate, flowers, Newbridge Silverware and a voucher for some beauty treatment. She will now go on to the national CarePlus ‘Carer of the Year’ awards this Friday night 23 November iin Dublin. They will be hosted by broadcasters, and patrons of the charity, Mary Kennedy and Marty Whelan. Danny O’Carroll and Paddy Houlihan from Mrs Brown’s Boys will be special guests on the day. According to a recent CSO Irish Health Survey, there are approximately 14,738 family carers in Co Kildare providing on average 45 hours of care per week in their homes. Family Carers across Ireland save the state a staggering €10 billion each year. Today 1 in 10 people provide care for a loved one in the home – by 2030, demographic changes predict that one in five people will take on a caring role. “We are delighted to recognise and celebrate Carers in every county of Ireland for their trojan work as family Carers,” said Catherine Cox, head of communications and Carer Engagement with Family CarersIreland. With limited access to services and particularly respite, Carers in Kildare are over stretched and receive little acknowledgement for their unpaid work with three quarters receiving no payment from the State.